I'm getting it sorted now for a trip up over the easter holidays. After rolling the front guards I messed with the camber settings on the coilovers and it threw the tow out something shocking. I have some bits coming to keep up with you turbo fellas soon. Belt driven! It was mad matts fault. He mentioned he was considering selling scarlett, the '89 mx5. It didn't take much encouraging for me to give her a good home. I've joined the long list of peeps that progress from a 323 to an mx5. It is for the best. Though the performance of the ba was spirited to say the least, dropping the jenvey'd beast of a bp into a lighter, rwd, more performance oriented chassis seemed to be a logical step. I did have plans to re-register the ba as a two seater to lose weight and a rotrex supercharger was just about to be added into the mix for more expletive inducing power; Matt had to mention his intentions. 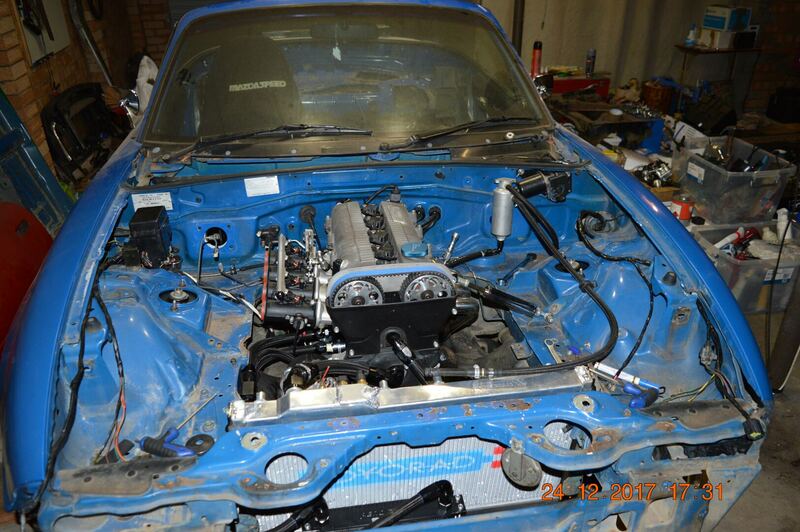 The bp is upon an engine stand receiving more enhancements ready to be dropped into the mx5. The ba is looking forlorn as it is stripped of the good gear ready to be sold on. I have a few bits and bobs laying around that i will put up for sale soon so if anyone are chasing this or that give us a yell. Everything will be going cheap or going to the crusher. A peek at the progress. Last edited by ghetto3; 18-08-2015 at 01:36 AM. still need the correct sump. Aj from mx5 mania has sourced one for me with windage tray and pick up. I still need to find some engine mount brackets though...and get cracking with the engine wiring loom. 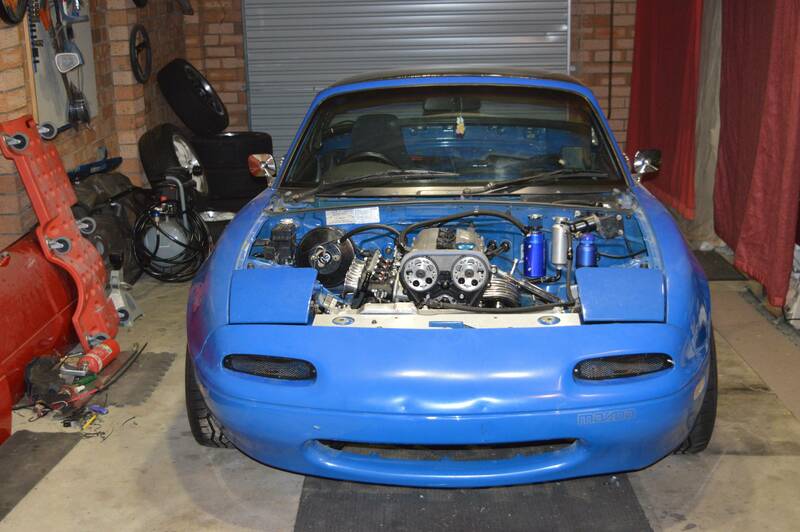 yer its funny its actually quite hard tring to find a na8 sump, and oil pickup..
yes i know. i get contacted at least once a week about NA8/BP parts. and sumps tend to be the most common question. what exhaust manifold are you using for the mx5? The list keeps getting longer but i am working on it every day and long into the night. As soon as i source some decent wheels for it i will give you a decent bargain on the rims eh' Matt? 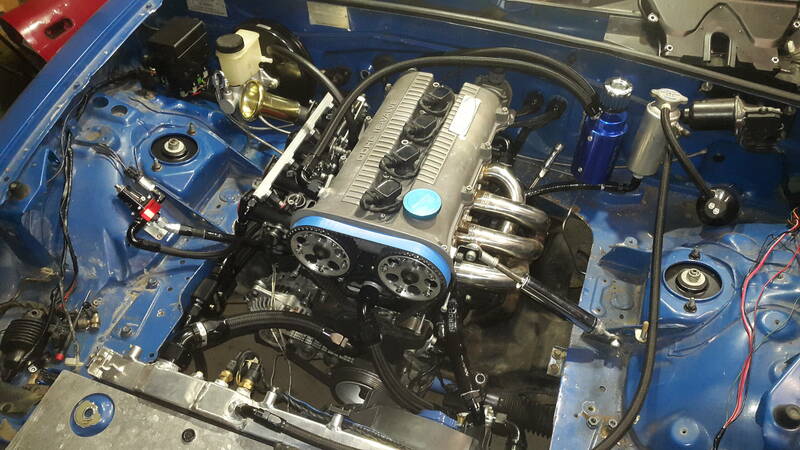 Hey lads, even though the ba project has finished her engine is still being modified to drop into the mx5 and i figured i'd end off this worklog with a couple pics of what is planned next. I picked this up pretty much for a song, and a set of mazdaspeed rims from mad matt and was just going to swap the b6 engine out, perform a few little maintenance jobs, no sweat. I started with replacing the clutch slave and the little bit of rust discovered about the brake booster kicked off a complete engine bay paint strip. The interior was rubbed back bare next The entire driveline has been binned in favour of later model subframes, torsen2 4.44:1 diff etc,etc. It was disassembled into single pieces almost overnight. A mock up of the rotrex bracket while measuring and planning. The engine has a new lower comp head being pieced together with standard dia. backcut supertech valves and new guides sourced from miataroadster. The earlier head was shaved 0.075" to squeeze the compression ratio up a bit. The new block is a stock (for now) low km 10:1 bottom end from a later nb mx5 . So to end up with a reasonable comp. ratio i'd either have to run a thick head gasket or find another excuse to work another bp head over. Last edited by ghetto3; 10-05-2016 at 06:06 AM. Some progress shots on latest mx5 project. Similar engine to what was in the Astina with new 10:1 bottom end and other improvements. Runs a reverse flow dual feed electric water pump setup. Wow you painted the old girl blue?? I wish! The red '89 mx5 was build no. 113 but i ended up parting it out after i got a decent offer for the seam welded shell. After stripping it down i found it had a damaged front left frame and was repairable but out of my means. This blue '90 na6 was meant to be a daily until i finished the red one but I've since dropped the built engine in and its turned into a full on project. We're gonna need a bigger screen! Hope the link works, been a massive struggle to keep forging ahead on the build with life generally, and injury etc getting in the way but dang it feels good to just turn the key and hear it bark! Nice stuff, it's always a relief when everything works as it should!